Jews of Kaifeng, late nineteenth or early twentieth century. 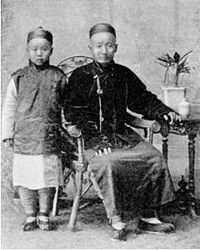 The Kaifeng Jews are members of a small Jewish community that has existed in Kaifeng, in the Henan province of China, for hundreds of years. Although Jews in modern China have traditionally called themselves Youtai (犹太, from Judah) in Mandarin Chinese — also the predominant contemporary Chinese language term for Jews in general — the community was known by their Han Chinese neighbors as adherents of Tiaojinjiao (挑筋教), meaning, loosely, the religion which removes the sinew (a reference to kashrut). According to historical records, a Jewish community lived in Kaifeng from at least the Southern Song Dynasty (960-1279) until the late nineteenth century. It is surmised that the ancestors of the Kaifeng Jews came from Central Asia. It is also reported that in 1163 Ustad Leiwei was given charge of the religion (Ustad means Rabbi in Persian), and that they built a synagogue surrounded by a study hall, a ritual bath, a communal kitchen, a kosher butchering facility, and a sukkah. The uninterrupted existence of this religious and ethnic group, living for over 700 years in socio-cultural surroundings strongly dominated by Confucian moral and ethical principles, is a unique phenomenon in Chinese and Jewish history. During the Ming Dynasty (1368-1644), a Ming emperor conferred seven surnames upon the Jews, by which they are identifiable today: Ai, Shi, Gao, Jin, Li, Zhang, and Zhao; sinofications of the original seven Jewish clan's family names: Ezra, Shimon, Cohen, Gilbert, Levy, Joshua, and Jonathan. Interestingly, two of these: Jin and Shi are the equivalent of common Jewish names in the west: Gold and Stone. When Ricci wrote to the "ruler of the synagogue" in Kaifeng, telling him that the Messiah the Jews were waiting for had come already, the "Archsynagogus" wrote back, saying that the Messiah would not come for another ten thousand years. Nonetheless, apparently concerned with the lack of a trained successor, the old rabbi offered Ricci his position, if the Jesuit would join their faith and abstain from eating pork. Later, another three Jews from Kaifeng, including Ai's nephew, stopped by the Jesuits house while visiting Beijing on business, and got themselves baptized. They told Ricci that the old rabbi had died, and (since Ricci had not taken up on his earlier offer), his position was inherited by his son, "quite unlearned in matters pertaining to his faith". Ricci's overall impression of the situation of China's Jewish community was that "they were well on the way to becoming Saracens [i.e., Muslims] or heathens." Later, a number of European Jesuits visited the Kaifeng community as well. The Taiping Rebellion of the 1850s led to the dispersal of the community, but it later returned to Kaifeng. Three stelae with inscriptions were found at Kaifeng. The oldest, dating from 1489, commemorates the construction of a synagogue in 1163 (bearing the name 清真寺, Qīngzhēn Sì, a term often used for mosques in Chinese). The inscription states that the Jews came to China from India during the Han Dynasty period (2nd century BCE-2nd century CE). It cites the names of 70 Jews with Chinese surnames, describes their audience with an unnamed Song Dynasty emperor, and lists the transmission of their religion from Abraham down to the prophet Ezra. The second tablet, dating from 1512 (found in the synagogue Xuanzhang Daojing Si) details their Jewish religious practices. The third, dated 1663, commemorates the rebuilding of the Qingzhen si synagogue and repeats information that appears in the other two steles. Two of the stelae refer to a famous tattoo written on the back of Song Dynasty General Yue Fei. The tattoo, which reads "Boundless loyalty to the country" (simplified Chinese: 尽忠报国; traditional Chinese: 盡忠報國; pinyin: jìn zhōng bào guó), first appeared in a section of the 1489 stele talking about the Jews’ “Boundless loyalty to the country and Prince”. The second appeared in a section of the 1512 stele talking about how Jewish soldiers and officers in the Chinese armies were “Boundlessly loyal to the country.” The same source even claims that Israelites served as soldiers in the armies of Yue Fei. Father Joseph Brucker, a Roman Catholic researcher of the early twentieth century, notes that Ricci's account of Chinese Jews indicates that there were only in the range of ten or twelve Jewish families in Kaifeng in the late sixteenth to early seventeenth centuries, and that they had reportedly resided there for five or six hundred years. It was also stated in the manuscripts that there was a greater number of Jews in Hangzhou. This could be taken to suggest that loyal Jews fled south along with the soon-to-be crowned Emperor Gaozong to Hangzhou. In fact, the 1489 stele mentions how the Jews "abandoned Bianliang" (Kaifeng) after the Jingkang Incident. Despite their isolation from the rest of the Jewish diaspora, the Jews of Kaifeng preserved Jewish traditions and customs for many centuries. In the seventeenth century, assimilation began to erode these traditions. The rate of intermarriage between Jews and other ethnic groups, such as the Han Chinese, and the Hui and Manchu minorities in China, increased. The destruction of the synagogue in the 1860s led to the community's demise. However, J.L. Liebermann, the first Western Jew to visit Kaifeng in 1867, noted that "they still had a burial ground of their own". S.M. Perlmann, the Shanghai businessman and scholar, wrote in 1912 that "they bury their dead in coffins, but of a different shape than those of the Chinese are made, and do not attire the dead in secular clothes as the Chinese do, but in linen". Today, 600-1,000 residents of Kaifeng trace their lineage back to this community. After contact with Jewish tourists, the Jews of Kaifeng have reconnected to mainstream Jewry. With the help of Jewish organizations, some members of the community have emigrated to Israel. In 1605, a Kaifeng Jew named Ngai T’ien visited the Jesuit missionary and scholar Matteo Ricci in Peking. Ricci’s account of the discovery of Israelites in East Asia sparked a flurry of research by Christian missionaries. Ricci wrote that they numbered only a few families and their only known synagogues were in Kai-feng Fu, the capital of Honan province, and Hangchow fu, the capital of Chekiang province. In the Kaifeng synagogue there was a Pentateuch of Moses on rolled up sheepskin parchment. He related that they had preserved the ceremony of circumcision and abstained from eating pork or any kind of meat with sinews. One scholar, Dr. Xun Zhou, doubts the authenticity of the Kaifeng community, believing it to have been largely a Western cultural construct. Xun Zhou, a research fellow at the School of Oriental and African Studies in London, maintains that the community had no Torah scrolls until 1851, when they suddenly appeared to be sold to eager Western collectors. She also states that drawings of the synagogue were doctored in the West because the original did not look like one, and that the Kaifeng community claimed to have kept some Jewish practices since before they are known to have begun. Xun Zhou's conclusion is that the Kaifeng community was not Jewish in any meaningful sense. Due to the political situation, research on the Kaifeng Jews and Judaism in China came to a standstill until the beginning of the 1980s, when political and economic reforms were implemented. The establishment of diplomatic relations between China and Israel in 1992 rekindled interest in Judaism and the Jewish experience, especially in light of the fact that 25,000 Jewish refugees fled to Shanghai during the Nazi period. Interior of the Kaifeng synagogue. The last census revealed about 400 official Jews in Kaifeng, now estimated at some 100 families totalling approximately 500 people, to 1,000 residents have ties to Jewish ancestry, though only 40 to 50 individuals partake in Jewish activities. It is difficult to estimate the number of Jews in any country, but in China it is nearly impossible. Numbers may change simply because of a change in official attitudes. For example, the number of ethnic Manchus during the reign of the last Manchu emperor was estimated at 2 million; after the fall of the Manchu Empire, Manchus, fearing persecution, virtually disappeared and only 500,000 were counted in the succeeding census. When official policies regarding minorities were changed, affording them protective rights, the number of ethnic Manchus jumped to 5 million. Thus far, some overseas Jewish communities have been indifferent toward the putative descendants of the Kaifeng Jews. However, the Sino-Judaic Institute based in California is involved in ongoing research on the history of the Jewish communities in China, promoting educational projects related to the history of the Jews in China and in assisting the Jews of Kaifeng  (Recently a family of Kaifeng Jewish descendants have formally converted to Judaism and have become Israeli citizens. Whether or not more Kaifeng Jewish descendants will follow in this family's path remains a matter of speculation. The upcoming documentary film, Kaifeng, Jerusalem, by Dr. Noam Urbach, describes the ordeal of this family. In his 1992 documentary series Legacy, historian Michael Wood walked down a small lane in Kaifeng that he said is known as the "alley of the sect who teach the Scriptures", that is, of the Jews. He mentioned that there are still Jews in Kaifeng today, but that they are reluctant to reveal themselves "in the current political climate." The documentary's companion book further states that one can still see a "mezuzah on the door frame, and the candelabrum in the living room." Similarly, in the documentary Quest for the Lost Tribes, by Canadian filmmaker Simcha Jacobovici, the film crew visits the home of an elderly Kaifeng Jew who explains the recent history of the Kaifeng Jews, shows some old photographs, and his identity papers that identify him as a member of the Jewish ethnic group. A recent documentary, Minyan in Kaifeng, documents and covers the present-day Kaifeng Jewish community in China during a trip to Kaifeng that was taken by some Jewish tourists. In The Kaifeng Stone Inscriptions: The Legacy of the Jewish Community in Ancient China, Tiberiu Weisz, a teacher of Hebrew history and Chinese religion, presents his own translations of the 1489, 1512, and 1663 stone stelae left by the descendants of the Kaifeng Jews. Based on the new info gleamed from this translation, Weisz theorizes after the Babylonian exile of the sixth century BCE, disenchanted Levites and Kohanim parted with the Prophet Ezra and settled in Northwestern India. Sometime prior to 108 BCE, these Jews had migrated to Gansu province, China and were spotted by the Chinese general Li Guang, who was sent to expand the borders of Han Dynasty China. Centuries later, the Jews were expelled from China proper during the Great Anti-Buddhist Persecution (845-46), where they lived in the region of Ningxia. Weisz believes they later returned to China during the Song Dynasty when its second emperor, Song Taizong, sent out a decree seeking the wisdom of foreign scholars. In a review of the book, Irwin M. Berg, a lawyer and friend of the Kaifeng Jewish community, claims Weisz never figured the many religious documents—Torah, Haggadah, prayer books, etc.—into his thesis and only relied on the stelae themselves. Such documents can be roughly dated from their physical and scribal characteristics. Even though he refers to Persian words utilized in the stelae, Weisz did not include a study on when the Judeo-Persian language of the liturgical documents first came into use in his thesis. Judeo-Persian first developed in Central Asia during the eighth century, well after the author supposes the Jews first entered China. Berg questions the historical reliability of the three stone inscriptions themselves. He gives one anachronistic example where the Jews claim it was an emperor of the Ming Dynasty who bequeathed the land used to build their first synagogue in 1163 during the Song Dynasty. Chinese Jews reading the Torah from a "chair of moses." Little of the written works of the Kaifeng have survived. A significant portion, however, are kept in the library of the Hebrew Union College in Cincinnati, Ohio. Among the works in that collection are a siddur (a Jewish prayer book) in Chinese characters and a Hebrew codex of the bible. The codex is fascinating in that, while it ostensibly contains vowels, it was clearly copied by someone who did not understand them. While the symbols are accurate portrayals of Hebrew vowels, they appear to be placed randomly, thereby rendering the voweled text as gibberish. Since Hebrew is generally written without vowels, a literate Hebrew speaker can disregard these markings, as the consonants are written correctly, with few scribal errors. Pulitzer-prize-winning American novelist Pearl S. Buck, raised in China and fluent in Chinese, set one of her historical novels ("Peony") in a Chinese Jewish community. The novel deals with the cultural forces gradually eroding the separate identity of the Jews, including intermarriage. The title character, the Chinese bondmaid Peony, loves her master's son, David ben Ezra, but cannot marry him due to her lowly station. He eventually marries a high-class Chinese woman, to some consternation of his mother, who is proud of her unmixed heritage. Descriptions of remnant names, such as a "Street of the Plucked Sinew", and of customs such as refraining from the eating of pork, are prevalent in this novel. Xu Xin, The Jews of Kaifeng, China, (Jersey City: KTAV, 2003). Xu Xin, Legends of the Chinese Jews of Kaifeng, (Hoboken: KTAV, 1995). Sidney Shapiro, Jews in Old China, Studies by Chinese Scholars, (New York: Hippocrene Books, 1984). William Charles White, Chinese Jews, 2nd edition (New York: Paragon, 1966). Pollak, Michael, Mandarins, Jews, and Missionaries: the Jewish experience in the Chinese Empire, (New York: Weatherhill, 1998). Shlomy Raiskin, "A Bibliography on Chinese Jewry", Moreshet Israel (Journal of Judaism, Zionism and Eretz-Israel), No. 3 (September 2006), pp. 60-85. ^ A Visit to Kaifeng by Beverly Friend Ph.D.
^ De Christiana expeditione apud Sinas, Book One, Chapter 11. Pages 107-111 in the English translation: Gallagher (1953). "China in the Sixteenth Century: The Journals of Matteo Ricci", Random House, New York, 1953. The Latin original text, De Christiana expeditione apud Sinas suscepta ab Societate Jesu can be found on Google Books. The corresponding text is on [pages 131 and onward] of Book One of the Latin text. This page was last modified on 4 October 2009 at 07:27.